As a systematic study of experience, Hakomi provides a detailed model of how to intervene on the physical, emotional and mental levels. The theoretical concepts as well as therapeutic Hakomi skills are taught, practiced and supervised. The curriculum includes: the healing relationship, working within the principles, states and maps of consciousness, character theory, the experimental approach, the flow of the therapeutic process and applying mindfulness in therapy. The training has a high teacher/student ratio and employs a variety of teaching approaches: experiential exercises, lectures, demonstrations, discussions, group process sessions, expressive arts, supervision, use of video and study groups. For more information, please download the Hakomi Professional Training brochure. For details presented here, please download the Hakomi Professional Training Information Sheet. To apply, please download the Application Form. 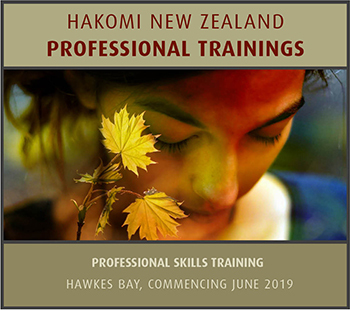 A new training, based in Hawkes Bay, will commence on 8 June 2019. This training will be held over 16 months in seven, eight-day modules. Each module begins at 10.00am on the Saturday through until 12.30pm the following Saturday. Each training is taught by a team of Certified Hakomi Trainers, Teachers and experienced assistants. Faculty are members of the Hakomi Institute Pacifica Team. The training will be under the over-all direction and lead of Certified Hakomi Trainer, Jules Morgaine. The training team includes Certified Hakomi Trainer Suhari Mommsen-Bohm, and Certified Hakomi Teachers Sarah Tait–Jamieson and Aladdin Jones. The training will also be supported by a team of Hakomi graduates who will assist as Tutors. © 2012 Hakomi Experiential Psychotherapy. Terms & Privacy. Site design & development: Lorella Ricci-Marriott & infoArts.